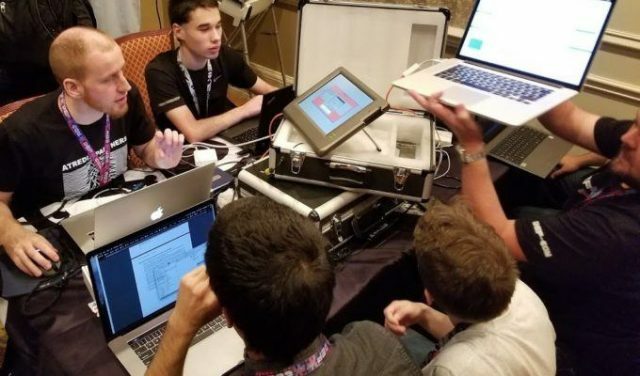 US Voting Machines Hacked, some in minutes at this year’s DEF CON “Voting Village” – not something you want to hear really. Especially with the results of recent elections that the World is currently dealing with the consequences from. Of course with physical access, most machines can be dominated in some way or another – but the scary part is some of them were done remotely, from a distance. After the debacle of the 2000 presidential election count, the US invested heavily in electronic voting systems – but not, it seems, the security to protect them. “Without question, our voting systems are weak and susceptible. Thanks to the contributions of the hacker community today, we’ve uncovered even more about exactly how,” said Jake Braun, who sold DEF CON founder Jeff Moss on the idea earlier this year. Perhaps we should really go back to pen and paper and indelibly marking people’s finger tips, not that it’s foolproof either but it certainly seems safer than these digital voting boxes built on Windows XP full of outdated software. I hope this really does act as a wake-up call to the US and any other countries using digital voting equipment that if it’s this easy to hack, you might want to do something about it. It’s one thing to physically nobble a box in front of you, which isn’t hard for election officials to spot and stop. It’s another to do it over the air from a distance. Apparently, some of the boxes included poorly secured Wi-Fi connectivity. A WinVote system used in previous county elections was, it appears, hacked via Wi-Fi and the MS03-026 vulnerability in WinXP, allowing infosec academic Carsten Schurmann to access the machine from his laptop using RDP. Another system could be potentially cracked remotely via OpenSSL bug CVE-2011-4109, it is claimed. We’re told the WinVote machine was not fully secured, and that the intrusion would have been detected and logged, so don’t panic too much. And not all the attacked equipment are used in today’s elections. However, it does reveal the damage that can potentially be done if computer ballot box makers and local election officials are not on top of physical and remote security, especially with a growing interest from Russia and other states. Think of it as a wakeup call. Pretty scary really, considering various elections around the World are crying foul of rigging (Kenya and Venezuela to start) and many claim Trump was elected due to rigging, probably from Russia. Of course a lot of it is conspiracy theorists running wild, but there’s certainly some truth in there and with what happened at DEF CON in minutes in most cases it just shows what other Nation States could be doing to global elections.